Become a Supporter. Get Updates. Get Invites. 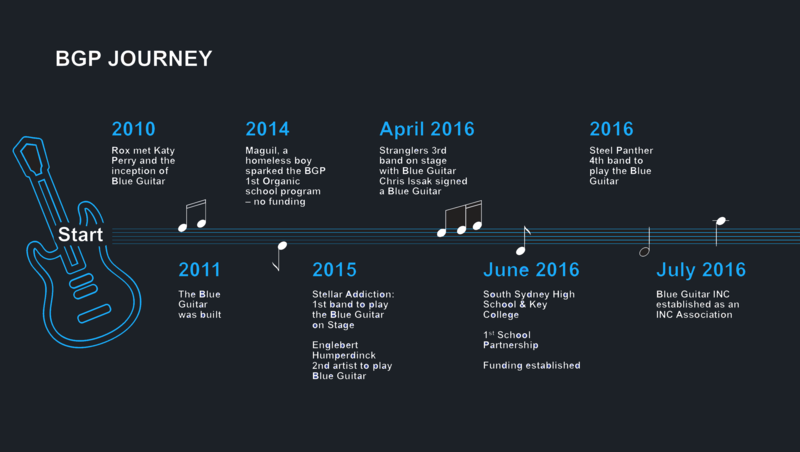 The Blue Guitar Project (BGP) is a developing charity aiming to give young, underprivileged teenagers aged 14-18 hope, inspiration and direction in life they would never otherwise be exposed to. 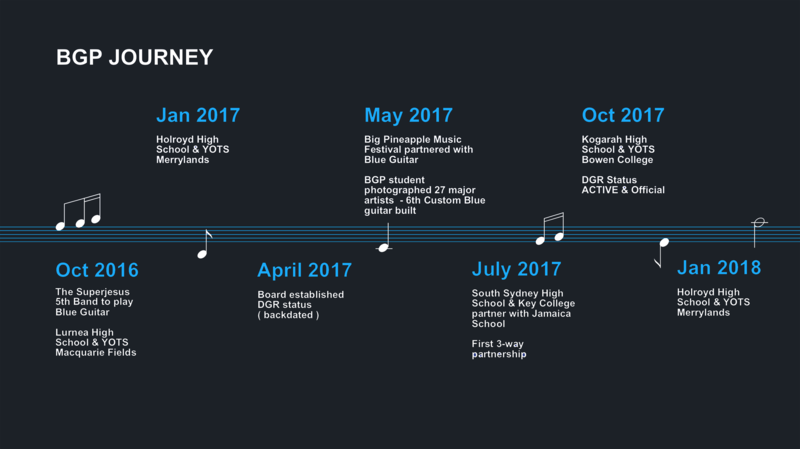 BGP started off as a single in-school program in August 2014 at Key College in Redfern, Sydney where the project began as a way to inspire and connect youth with their dreams. It has now grown to encompass over 14 high schools in Australia and one in Jamaica with more commencing each term. As BGP rolls out it aims to partner mainstream schools, both Public and Private, with corporates and brands to support underprivileged school groups throughout the world. Everyone is entitled to have a dream no matter who they are or where they come. We believe the inclusion of both school groups working together will benefit the way teenagers interact and learn from each other, creating valued relationships and an understanding of human differences moving forward - all in line with the three core pillars of humanity (our 3 chords within the program): Unity, Equality and Freedom. "BGP instils a belief that allows students to dream big and achieve anything they put their mind too. 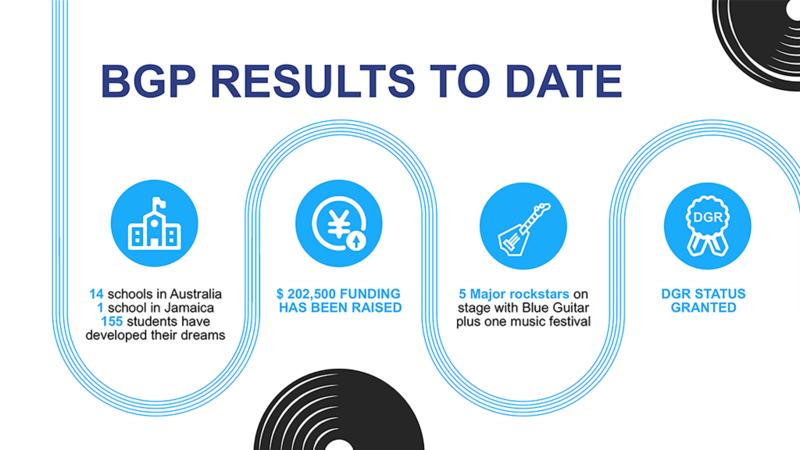 Without a doubt, I encourage more schools and businesses to get behind the Blue Guitar Project." The Blue Guitar Project was created from one spark of inspiration from a colourful young homeless boy named Maguil. Roxy Lee, a freelance music photographer, met Maguil out of the blue when she was on a photography shoot in Redfern, Sydney. 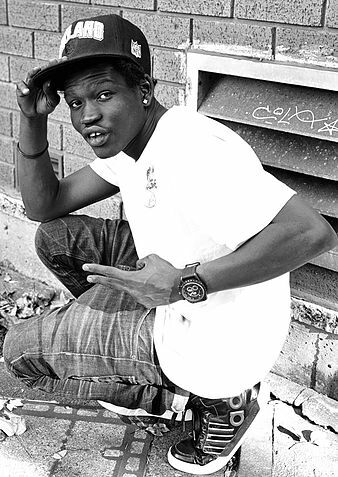 Confident and bouncing with a hip street-vibe, his big personality and direct attitude was magnetic! He asked her to take a photo of him so she did his own special portrait photoshoot. She had no idea at the time that he was homeless, or that he would have such a huge impact on her life, inspiring the BLUE GUITAR PROJECT to take shape. Sometime after the shoot, Maguil called Roxy, - he was in a terrible crisis. He had no where to sleep and nothing to eat. After several calls, meeting his school teachers at Key College (a Youth Off The Streets school) she realised what he wanted was the same as any of us: he wanted his own dreams to come true. He wanted a passionate and fulfilling life - a safe and happy life off the streets. Where he didn't just have food and a place to call home, but a community, purpose and a true passion. And one more Blue Guitar!